Actually not a Vintage Dog this time. That's Jager's reflection we see there. The terrier's still alive and well and frankly driving me nuts this morning mercilessly tormenting the cat. 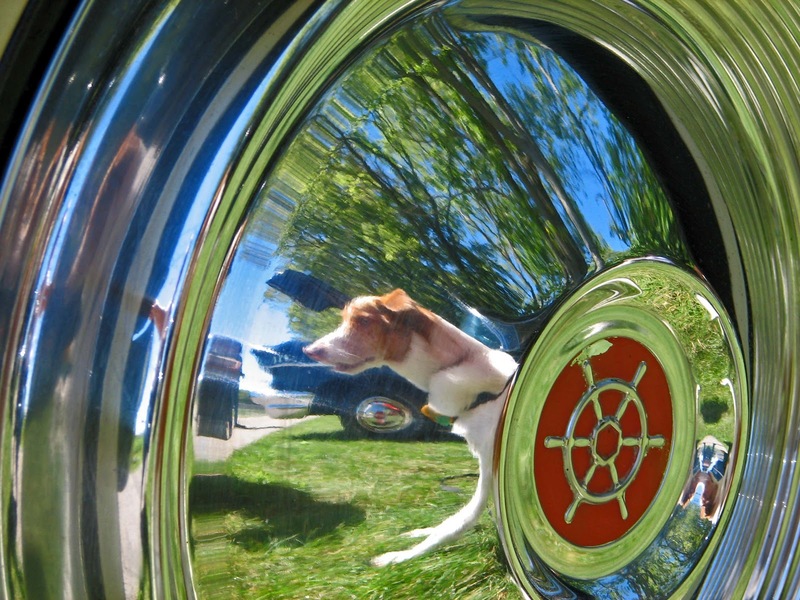 Rather, we have a vintage car sporting Jager's funky little self in the shined up wheel cover. We'd set up camp at a local car show with a family member's 1954 Packard Constellation. We could have used Jager as a guard dog of sorts, I suppose, if he wasn't all love me, love me, LOVE ME with everyone that came by. A former stray, he's got some savvy street smarts. Working those soft brown eyes to share that they don't feed me on Saturdays. Won't you give me that hot dog, please sir?